A century has passed since the beginning of the First World War, and now only the letters from the front allow us to fully feel the terror of the men that were involved in it. 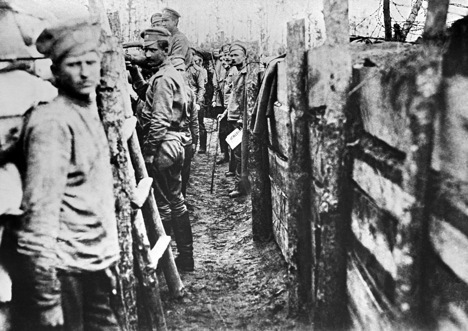 At the outbreak of war, Russia implemented the “Provisional Regulations on Military Censorship,” which allowed the government to review and seize any letters from the front, if they contained any secret information. Thanks to this regulation, we can now read these letters. Now they are located in the archives, especially in the Russian State Military Historical Archive, where several volumes of letters from the front have been preserved. At the initial stage of the war, many were full of illusions. “Of course, this is a tough enemy, but nothing that we can’t handle – and all fully believed in our final victory,” wrote Colonel Samsonov to his wife. Everyone sympathizes with this war, and all are going hunting for Germans.” The thoughts of the coming victory were voiced in many letters of this period. Deprivation, blood, trench dirt, and the deaths of comrades – that is what the First World War looked like, unprecedented for humanity at beginning of the twentieth century in its scale and the number of war victims. First published in Russian by Expert magazine.